I had my doubts about this show the first time I saw ads for it. After all, it debuted during Season 2 of Ash vs. Evil Dead and looked from previews to be little more than a rip off of the overall concept targeting fans of the already well-established franchise. And who knows, maybe that was the original intention of the studio when they began production. But what has unfolded has been an incredibly original horror comedy like nothing else on TV. The series focuses on Stan Miller, the former sheriff of Willard’s Mill who has seemingly broken the curse that plagued the top lawmen of the small hamlet for the last 400 years, only to be harassed by an endless stream of demonic creatures born from the town’s legacy of mass murder. Played by John C. McGinley (Scrubs, Platoon), Stan is an indifferent chauvinist with old-school views of masculinity, trying to sort out his life, now that he’s a widower and a retiree. A healthy dose of humanity and that trademark sarcasm that McGinley is known for help make the character very real and very relatable, however, and allow for the some of the most hilarious interactions between Stan and his space cadet daughter, Denise (Deborah Baker Jr.), and the new sheriff, Evie Barret (Janet Varney). The show has this genuinely low-budget, independent feel that very much reminds me of some of the best things about all of those schlocky ’80s horror classics that we’ve come to know and love. With a mixture of practical effects and low-end CGI, the show takes on a very cheap, campy image, at times, that is absolutely phenomenal when coupled with the performances and writing style. My favorite, so far, has been the pig/pig monster from Season 1 that Denise falls in love with. During their porcine exorcism, the zipper is exposed in the back. It was very much like the battle with the demon-possessed Henrietta in Evil Dead II. Another wonderful example, and callback to the Sam Raimi classic, is the wraith from the Season 2 opener of Stan Against Evil, in which a large-scale puppet akin to the winged Deadite from Army of Darkness explodes out of a grave to terrorize the cast before being put down by Stan with a swing from a shovel. The Good, The Bad and The Ugly in Stan Against Evil. 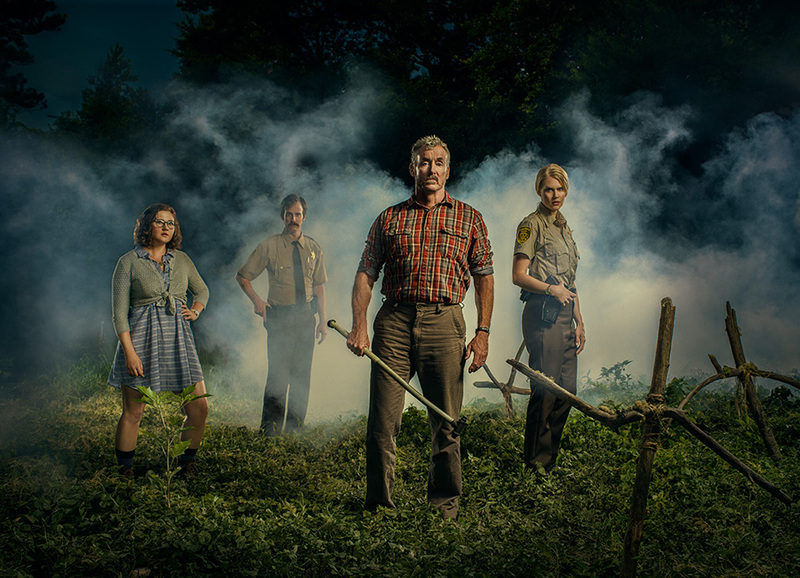 Stan Against Evil has neither the pop-culture following, nor the dubious mythology of Evil Dead and other franchise horror classics that it both emulates and pays homage to and that is the greatest success that it has going for it. Unlike Ash vs. Evil Dead, which has 35 years’ worth of history and backstory to remain true to, Stan Against Evil is a blank slate. If they want to take an episode down a dark, ominous storyline, they can do so without worrying about what will happen to the continuity of the show, overall. Likewise, if they want to go off the rails, Monty Python-style ridiculous for a moment, they aren’t tied down to a definitive source. This is a series and a narrative still being developed and grown with the intention of being equally as bizarre and creepy as it is hilarious and irreverent. It’s the biggest advantage that an original series or film has over a rehash of a beloved classic and I can’t wait to see how it continues to develop during Season 2. With horror icons like Jeffrey Combs making appearances this season, fans will definitely be in for some creepy treats. Stan Against Evil airs Wednesday nights on IFC and is available on Amazon through Starz.